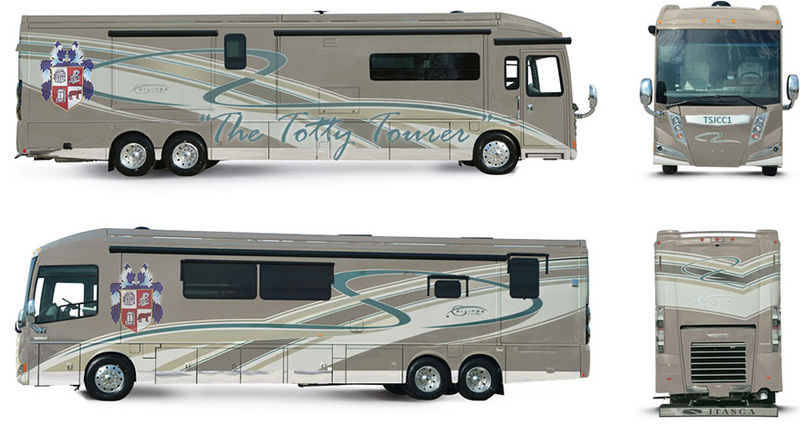 Your committee is delighted to announce that following extensive discussions we have purchased a custom RV for club use. In a concerted effort to provide as many benefits to club members as possible, we feel that subsidising transport to matches and club events dovetails perfectly with the 2015 reduction in match fees. 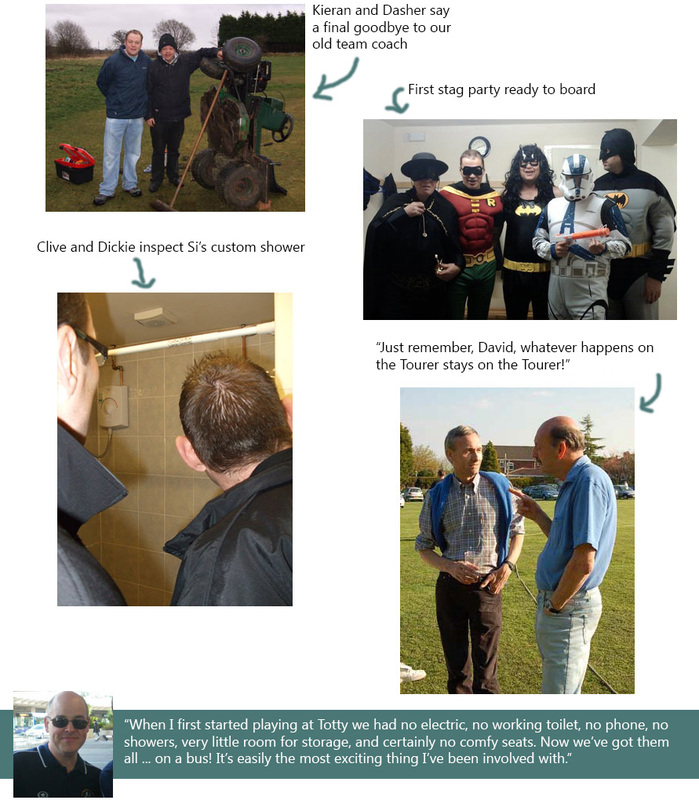 We’re thrilled to present “The Totty Tourer”. 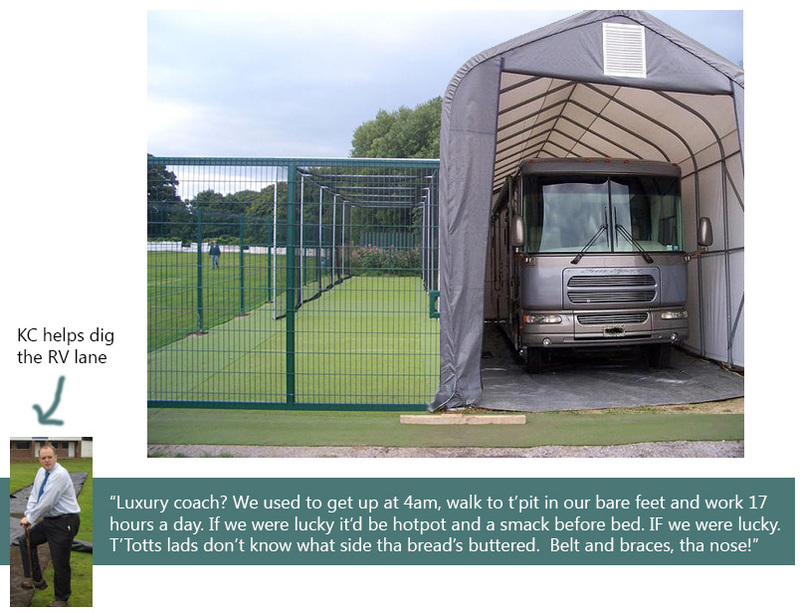 In January 2015 we were contacted by Avril Mayweather from Lancashire Winnebagos who offered us an unmissable deal - a custom, TSJ branded vehicle ideally suited both for local travel and for getting our teams across the Channel for tour events. Coming in at a fraction under £200,000, this seemed like the best use of surplus club funds. Who needs a level ground or heating in the pavilion when we can have a 40 seat, fully equipped touring machine? While the exterior looks are superb, where the Totty Tourer really scores is in its fully customised interior. Recognising that players need to arrive at games both refreshed and in comfort, we have installed three gaming machines, a 72” LCD TV panel and a fridge capable of storing over 2,000 cans and bottles. There’s even a separate shower and toilet for Simon Marsh. Some of the interior stylings can be seen on the images below. In order to create a parking space for the RV we have had to re-purpose one half of the outdoor nets, but as hardly anyone ever turns up we didn’t think this would be a problem. We asked our resident metals expert Matt Hunt and pyromaniac Dickie P to create us the new garage and we couldn’t be happier with the results. 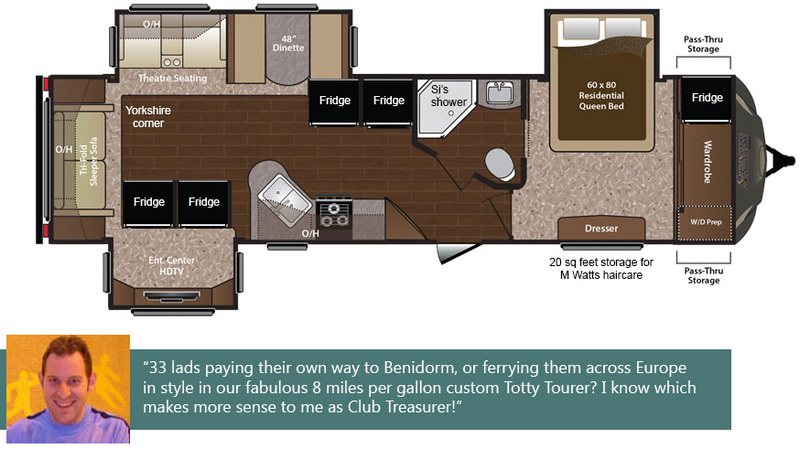 The full floor plan of the Totty Tourer is shown below. Aside from the initial outlay of £199,995, the club has also been forced to pay various other incidental expenses. These include £1,500 to Bury Council to widen the existing entrance to Crompton Meadows from several feet to around 20 metres to allow access, £40 in fire marshal costs due to Dickie P’s fires, £3,000 in materials and time for modification of the net / garage, and a £50 cost to the local authority as every time the 150 decibel sound system is turned on as it poses a threat to the multitude of wildlife living in the natural habitat around Crompton Meadows and the Island Lodge. These include 7 species of bat, sundry wading birds, small mammalian life, and a few unsuspecting local residents. However there are immediate plans to recoup some costs. The Totty Tourer is available to hire for functions such as stag and hen parties, parliamentary election campaigns, and for general larking about on a Saturday night after the match. See Clive for details.